While you may have never heard of pet therapy before, it is an increasingly popular and effective form of therapy, especially in the elderly community. Here at All Seniors Care, we always make a point of staying on top of the best, most impactful treatments to ensure that our residents’ quality of life is as high as possible. Aside from entertainment and programming that includes Wii bowling, aqua fit, billiards, chair yoga and gardening clubs (you can check out our latest events and browse the ASC Facebook page for upcoming ones), we also encourage more focused therapeutic activities such as sensory rooms, basic strength training and pet therapy. Whether our residents bring their own pets or need pets brought in to visit, we are happy to accommodate in order for them to get the many benefits of cuddling a furry friend! Pet Therapy Sounds Great, What Is It? It’s just about as simple as it sounds: when people – especially older adults – are regularly given the opportunity to play with an animal, it is shown to have health benefits across an incredibly wide spectrum. Pets can increase mobility from activities such as brushing and petting. Provide an incentive to exercise if they need a walk or want to play fetch. Lower blood pressure by the simple, gentle, non-judgmental nature of the relationship. Social stimulation from interacting with the pets’ handlers. Planning & flexibility from needing to feed the pet at appropriate times and respond to its spontaneous behaviour. Memory stimulation from comparing it to other pets from previous visits. We’ve seen amazing results from pet therapy in our retirement residences for seniors in Ontario, Manitoba and beyond, it truly does work wonders! You can see pictures of some of the wonderful pets and lots more over on our Instagram account if you’re curious; if you scroll down you’ll notice a great picture of one of our resident’s with a horse – highly intelligent animals who make excellent therapy partners! Temperament – must have a calm temperament, since a rowdy pup that loves to jump around and make mischief could disturb some residents. “People” Dog – should be predisposed towards attention from anyone, without discriminating (between men and women for example). Non-reactive – most dogs are used to the stable environment of their home. Even if a dog is usually very calm in a home setting, they may be overwhelmed by strange sights and sounds and start barking and jumping on people. Cats are somewhat less popular as therapy pets due to their aloof nature, but some folks are just cat people by nature, there’s no getting around it! Manx cats can make especially good therapy pets, on account of they tend to be more loyal. Locking down the same Manx cat week to week is important, however, in order to allow that loyalty to develop. Another benefit of cats is that they require less looking after. Birds and fish don’t take up much space or require as much care or attention, but on the other hand, there is less of a physical element to the therapy. Fish and birds can help create a more pleasant atmosphere, but they will not yield the same positive results as dogs and cats, or visiting with farm animals. Here at All Seniors Care, we place a lot of emphasis on the activities of daily living, including mobilizing, communicating, eating well and so on. As you get older, making sure you’re ticking these fundamental boxes can mean the difference between living a happy, well-rounded life or slipping into lethargy. 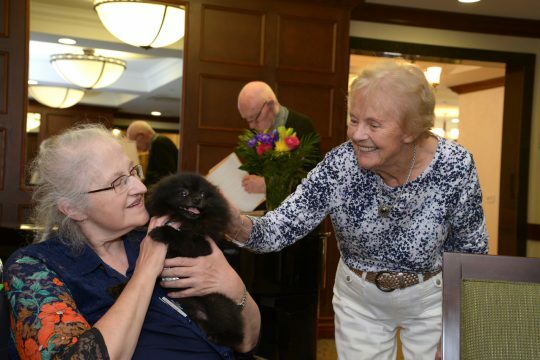 We’ve observed our residents brightening up immediately when a favourite pet owner stops by to drop off their poodle – there’s an immediate point of connection, and the physical affection shown by dogs is incredibly valuable. Much of what keeps us healthy and vital on a day-to-day basis is that simple feeling of connection. When it starts to wane, we can easily slip into a state of melancholy. A visit from an affectionate and playful animal creates a point of connection between individuals and the pet, and between all of the residents who are bonding over the playful pet. The valuable bonding experience is at the core of all of our group activities, from shuffleboard and bocce ball to gardening and baking. A key difference with pet therapy, however, is that the center of attention is a living, breathing being! Certain elderly care facilities that are more focused on business than quality and family values, will set up shop in industrial neighbourhoods or areas where there is not much green space and trees. All Seniors Care makes a point of providing walking paths and green space, which is ideal for walking animals. Furthermore, animals themselves remind us of nature, of the wilderness and all the beauty and possibilities it contains. There’s a good reason that many of the most revered paintings are gorgeous landscapes, and that humans seek out hiking and camping whenever they can get out of the city. A connection with nature relieves stress and releases endorphins, making for a happier, healthier mind. If you weren’t sure about pet therapy before reading this, hopefully we’ve opened your eyes! We’ve certainly seen some amazing benefits from these visits, and are happy to add pet therapy to our ever-expanding toolbox. You can learn more about us and our dedication to creating the best retirement residences in Canada by exploring our website, and feel free to call anytime for more info!